- For all further news and annoucements please visit or Facebook page: Microsat at Facebook. - Today, when making some development, I sadly realised that not all DS18B20 thermometers with cable are able to work in "parasite power" mode. Devices from last delivery of DS18B20/CABLE simply do not work when VDD pin is not powered with positive voltage. Therefore they will not work with PLXDigi, PLXTracker, PLXTracker Blue devices which use 2-cable connection for thermometer. Sorry for problems, I was really surprised about that. This problem does not apply to DS18B20/TO92 thermometers sold as separate chips without cable. - We have released a firmware update for PLXTracker Blue v1.02. Please update your firmware as it fixes some Configurator configuration read problems and telemetry module support. - Few days ago we added a new product to our offer: PLXTracker Blue, which is an APRS tracker with built-in Bluetooth interface. Works great with APRSDroid. Printed circuit boards arrived yesterday and now we have a full stock of these devices. - I have updated manuals for WX3in1 Plus 2.0 and WX3in1 Mini to reflect latest firmware versions for these devices. - I fixed a Configurator v1.46 for WX3in1 Plus 1.0. By mistake it was compiled without firmware and asked for external firmware file. - We have a new development firmware update for WX3in1 Plus 2.0 v1.09. The most important new feature is a full 9600/GMSK decoding/encoding support and I would really like to get some feedback how it behaves in the field. Other features are extended functionality of APRS-IS simple server and an option for global transmit disable in "Output adjustments" Tab via WWW. - As promised, we have a development firmware updates for WX3in1 Mini v1.19 and WX3in1 Plus 1.0 v1.46. They include similar serial port, KISS TNC, Bluetooth features like in WX3in1 Plus 2.0 firmware (except APRS-IS simple server function). - We have a new development firmware for WX3in1 Plus 2.0 v1.08. There is a lot of new features including Bluetooth support (check out my new BT/Microsat module! ), KISS packet output, APRS-IS simple server emulation, etc. A lot of TNC features which work great with APRSDroid (via Bluetooth or TCP/IP socket). Also PeetBros and Davis weather stations support was fixed after being unusable in v1.07 :). PeetBros stations should now work in both DATALOGGER and COMPLETE REPORT modes. - similar updates for WX3in1 Mini and WX3in1 Plus 1.0 will come soon. - Fixed a bug in WX3in1 Plus 2.0 v1.07 which made impossible to enable/disable a thermometer from WWW level. Firmware version remains the same, please download a fixed v1.07 again (no need to rewrite configuration, only firmware update). - We have a new development firmware for WX3in1 Plus 2.0 v1.07 and WX3in1 Mini v1.18. New features include KISS packet output, voltage measurement calibration and a few other things. I am currently working on Bluetooth module support and a lot more of nice features. - We added a new CAB44 cable which allows to simply connect GPS-RS232 Receiver/Microsat (minidin 6-pin) to WX3in1 Mini. Latest WX3in1 Mini v1.17 firmware supports GPS receiver for mobile beacons. - We have a new development firmware for WX3in1 Mini v1.17 which fixes a WS-23XX weather stations bug from v1.16. Heh. - We have a new development firmware for WX3in1 Mini v1.16. Most importantly a GPS support was added and a serial port function selection box. Now it is possible to choose between weather station, GPS and other devices connected to serial port of WX3in1 Mini. Dynamic GPS position and time can be sent as a part of a beacon. - I found a bug in DHCP support code of latest development firmwares: WX3in1 Plus 2.0 v1.03-v1.05, WX3in1 Mini v1.12-v1.14, WX3in1 Plus v1.42-v1.44. This bug causes APRS-IS connection lock when DHCP is enabled and DHCP server assigns a different IP address than before during lease renewal (which may happen after router/dhcp server reset while WX3in1 device is on-line). Therefore we release a fixed development firmware versions for WX3in1 Plus 2.0 v1.06, WX3in1 Mini v1.15, WX3in1 Plus v1.45. - We have updated and added all remaining schematics for WX3in1 Plus 2.0 and WX3in1 Mini "to radio" cables. All of them are now available for download in PDF format. Some of the cables which were available only for WX3in1 Plus 2.0 are now also available for WX3in1 Mini. - We have a new development firmware for RPTC and RPTC/GSM v1.08, which fixes a bug related to admin numbers 2-4 and also adds a debugging SMS option allowing to send debug SMS messages to admin number 1. - We have a new development firmware for WX3in1 Plus 2.0 v1.05, WX3in1 Mini v1.14. These updates fix an important bug causing problems with configuration changes via WWW in earlier development firmware versions. WS-23XX weather stations driver was also rewritten and should prevent communication hang-ups with these stations. - We also have a new development firmware for WX3in1 Plus v1.44, PLXTracker v1.05, PLXDigi v1.07 which adds the same WS-23XX weather station fix to these devices. - Finally we are back from vacations and will start to process all pending orders as soon as possible. - During my absence (until 26 July) I applied a little discount for our WX3in1 Mini devices and telemetry modules. - We have a new development firmware update for WX3in1 Plus 2.0 v1.04, WX3in1 Mini v1.13 and WX3in1 Plus v1.43. This update fixes a bug in Mic-E decoding for digipeater range and area filters. Longitudes of 0-9 degrees were decoded as 100-109 degrees. - Also we have a PLXDigi v1.06 development firmware update which adds range and area filters for digipeater. - We have a new development firmware update for WX3in1 Plus 2.0 v1.03. New functionality includes experimental DHCP support, advanced range-limited and area-limited digipeating, and a list of received stations available via device web page. Also beacon maximum length was increased to 96 characters (was 64). - We have a new development firmware update for WX3in1 Mini v1.12. New functionality includes experimental DHCP support, advanced range-limited and area-limited digipeating, and a list of received stations available via device web page. - Similar updates for WX3in1 Plus and WX3in1 Plus 2.0 will come soon. Also PLXDigi digipeater features will be updated for range-limited and area-limited digipeating. - We are back and will process all pending orders as soon as possible. - Between 27 April and 1 May 2015 we will be away. All orders placed within this time will be shipped when we return after 3 May. All pending orders will be shipped today (on Friday). - We have a new (development) firmware for WX3in1 Plus 2.0 v1.02 with new functionality for input and output level adjustments. New features are available via device web page. Please check our new WX3in1 Oscilloscope feature (example screenshot HERE). - We have a new (development) firmware for WX3in1 Mini v1.11 with new functionality for input and output level adjustments. New features are available via device web page. 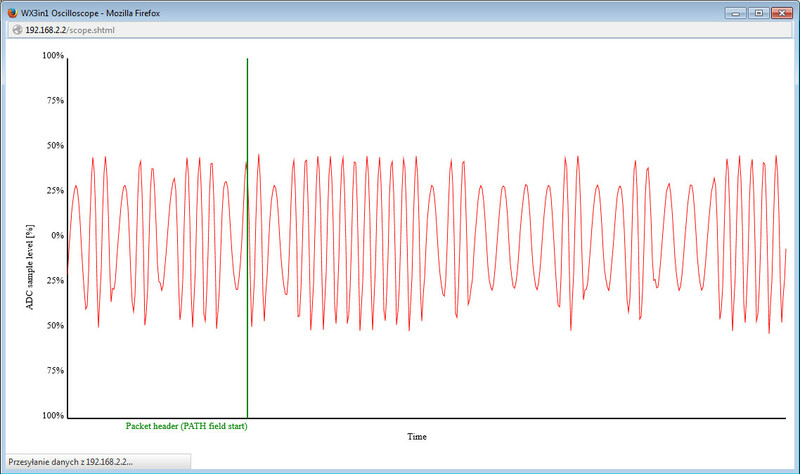 Please check our new WX3in1 Oscilloscope feature (example screenshot HERE). - There is a new (development) firmware for PLXDigi v1.05 which supports DS18B20/DS18S20 thermometer connected to RS485/A+ input. You need to make a proper cable for such connection or order one of our CAB14/THERMO to CAB18/THERMO cables (schematics available). Any feedback about this new feature will be appreciated. - We finally have a new firmware update for WX3in1 Plus 2.0 v1.01. This update fixes some bugs, including negative temperature bug in beacons (winter came to Poland and some of WX3in1 users reacted immediately :). - More updates will be available soon! I feel my programming powers return :). - New firmware versions for our devices will be marked as "development". It means that they need some more testing because it is not possible to check everyting within a short period of time. After some tests and possible some feedback from our users, they will be moved to "stable" stage. - There is a new (development) firmware for PLXTracker v1.04 which supports DS18B20/DS18S20 thermometer connected to RS485/A+ input. You need to make a proper cable for such connection or order one of our CAB14/THERMO to CAB18/THERMO cables (schematics available). Any feedback about this new feature will be appreciated.